Dreaming of relaxing holidays next to the sea? 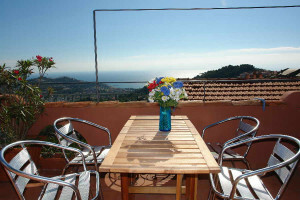 Check our offer of holiday homes by the sea to make it happen. Sunshine, sand and the beach - what else does one need? 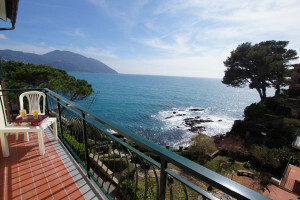 A house directly by the sea is probably the most beautiful thing one can have during vacation. Upon arrival at the holiday house, only the most essential things are unpacked and away you go to enjoy the beach for the first time in a whole year! The kids dip their legs into the seawater and play in the shallow waves. 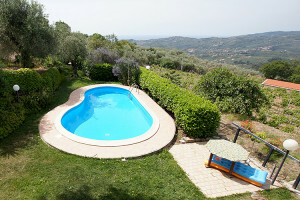 This is probably the most exciting moment for your children during this year's Italian vacation! 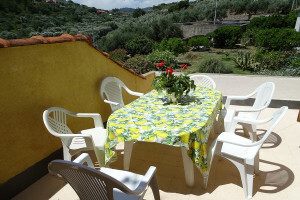 Since the holiday house is located not far away from the beach, you can reach it within a few minutes on foot or by car. The fine sand and the pleasant, refreshingly clear water will not let you stop going into raptures about the whole thing. But even the gravel and rock coastlines have an attractive charm of their own. A cool ice cream from the Gelateria opposite your house will give you strength for a fun-filled volleyball match with the entire family. 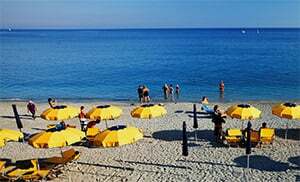 Many beaches in Liguria are decorated with the Blue Flag (Bandiera Blu) which stands for cleanliness and neatness of the beach as well as for the high quality of its water. When you go diving and snorkeling, you will discover the breathtaking variety of species in the under-water world which Liguria has to offer. Or you can go on a tour of the coast using the sailing boat and enjoy the air stream on board. Even those who love surfing will get their money’s worth in some sections of the coast and can take off into the waves with their surf boards. One can rent a board for the newly-discovered sport, the so-called "Stand-Up-Paddling", or a canoe cheaply for a couple of hours on many beaches. 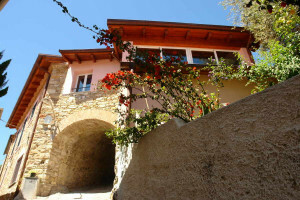 Moreover, you should absolutely try the culinary specialties in one of the restaurants or farmhouses (Agriturismo) by the sea. 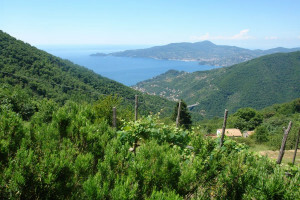 Wines from the region, the best olive oil and local products are simply part of a proper holiday-house vacation in Liguria. You will get to taste the best types of Italian ice-cream when you amble along the seafront, and your day in Italy will be perfect! After taking in enough sunshine you will then retreat back to your own holiday house. While the kids are again plunging into the private pool or are staying a bit longer by the sea, the preparation of supper in one’s own kitchen gets under way fantastically. 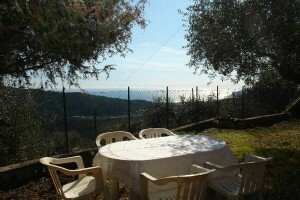 This is made possible by the short distance between the beach and the house! Even shopping can be organized easily. You will come across many supermarkets and smaller shops in the vicinity as you walk from the beach to the holiday house, e.g. the local "Alimentari" in which locally grown and fresh foodstuffs are often sold, so that you are spared long journeys by car. 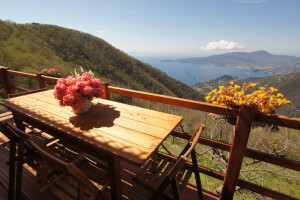 You can reach most coastal villages easily by train; vacation without a car and parking-lot-worries is even more restful, and you will return home with the bike in the evening fully fit, filled with fresh air, the wind from the sea and sunshine. 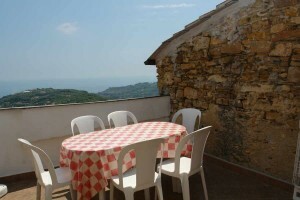 The meal can be had on one's own terrace, where you will once again get the opportunity to enjoy the marvelous view of the sea. 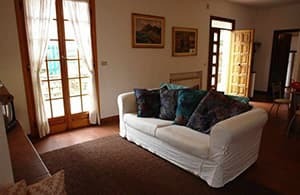 Off you go with the soiled towels into the washing machine and you can then wind down the evening undisturbed in your private holiday house. Do not forget to buy the smoke sticks in the supermarket for placing on the terrace floor, for they act as effective protection against gnats. So whoever would like to spend his vacation in a holiday house by the sea, will get everything that his heart desires when he deals with us. 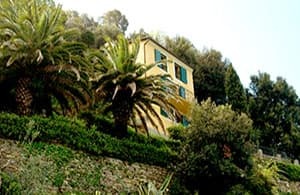 A vacation house with one bedroom or several bedrooms, with a private pool and terrace, with a view of the sea or even in the province of his own choice – our holiday house catalog offers a wide range of houses to choose from: holiday houses and holiday apartments in Imperia, San Remo or in another nice town in Liguria. 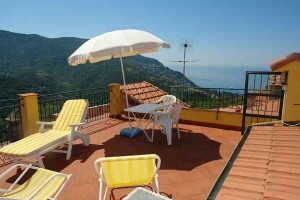 Choose your holiday domicile together with us and get to experience vacation directly at the Ligurian coast!